For me, the problem becomes particularly clear when I consider that all design processes are decision making processes. To design, that is, is to make a series of decisions. Imagine you’ve drawn up a detailed permaculture design on-paper (or on-computer) such as the example here (one of my earliest professional designs). When we examine an object, we may see that each element in the object (part, line, edge, position, color, size) represents a decision. In very rough terms, we may that each line represents a different decision. We may also say that each line has created space on either side of it and near it, and therefore typically represents some four or five decisions about space (through size, convexity, adjacency, organization). Each element has the possibility of being wrong. By that I mean the element as placed, sized, and oriented, may be well-adapted to its neighbours, to the space around it, to the conditions which exist, and to the conditions arising from the structure of the surrounding elements – or it may be badly adapted to the neighbours, conditions, space, trees, arising from surrounding elements. We are going to count the number of possible mistakes, and try to estimate how many of these mistakes have been avoided, and how many have been committed, in different types of plan. It is here, that we shall see the vast superiority of generated plans. They avoid mistakes. A fabricated plan cannot avoid mistakes, and in all fabricated plans, the overwhelming majority of possible mistakes, are actually committed (2002, p. 186). Consider the hundred or so permaculture design examples here, examples I personally had a hand in. Consider the example of permaculture designs given in youtube videos like this or this or this. In terms of the current analysis, these designs constitute the aggregation of hundreds or even thousands of decisions, all, it seems, made on a piece of paper before any implementation. If Alexander is right, many of these decisions are likely to be mistakes, or at least not as on-track as they would be if they were made at a more appropriate moment in the actual unfolding of the garden or space being designed and created. As is hopefully decipherable from the diagram, in both approaches you start with a decision that needs making (such as where the new driveway will go). Then, in both approaches, you survey your options (or different ways of making that decision, such as the driveway could go like this, or like that, or what about around here like this? etc). You then, in whatever way, test the options and select one. The type of testing is not relevant here – it might involve thinking, doodling, marking out on site, consulting experts, whatever. The point is that one way or another you make a decision – you select an option. Now, again in both approaches, you draw in that decision on your plan (for example you might draw in where you’ve decided is the best spot for the new driveway). Here is where the paths diverge. 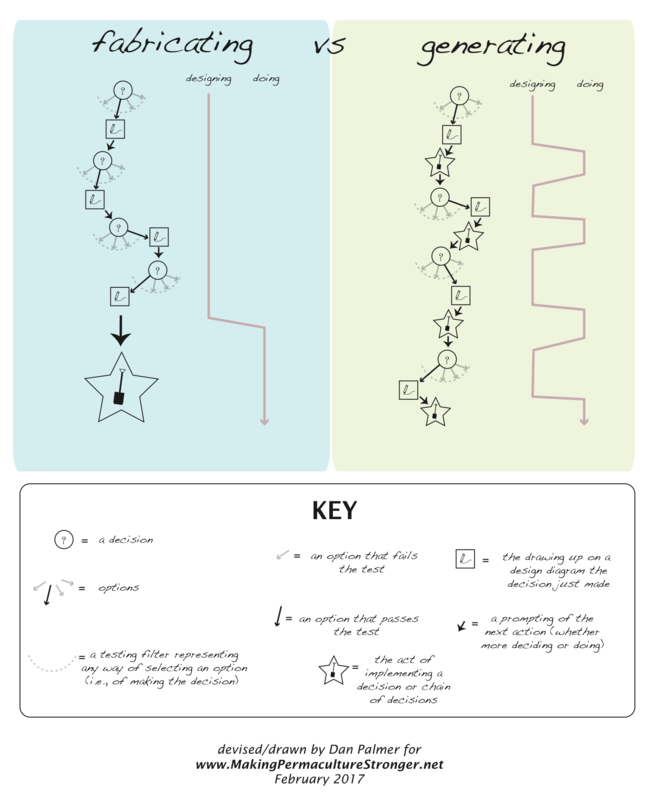 In the fabricating approach the just-drawn-in decision prompts another decision, and you re-enter another round of the same sequence you’ve just completed. In the generating approach, you go out and actually implement that decision on the ground. The actual reality of the implemented decision (for example the actual driveway itself once installed) now prompts and provides a context for making the next decision. In the fabricating process the rhythm is therefore decide-draw-decide-draw-decide-draw before moving on to a big chunk of (post-design) DOING. In the generating process the rhythm is decide-draw-do-decide-draw-do-decide-draw-do such that the designing and drawing only get ahead of doing by a decision or two. Perhaps the key to it is that in a generating process, apart from the first decision, all key decisions are directly prompted by the just-updated reality of the site. In a fabricating process, by contrast, apart from the first decision, all key decisions are directly prompted only by the just-updated reality of a drawing of the site. Alexander claims (and I obviously think he has a point) that if you are making your design decisions based on what you’ve just drawn, you just don’t have access to enough key information to avoid making a shitload of mistakes. You are engaging in some degree of fantasy,2 and you will get off track. Christopher Alexander makes a strong case that the process of completing a detailed design before implementing it (fabricating in his language) is inherently flawed. If we wish to create systems more akin to the rest of nature, Alexander agues we must us a generating process, where decisions are made inside and during the creating process, not before it. In the posts to follow we’ll explore some resonant voices both inside and outside permaculture, we’ll further firm up how this might play out in practice, then we’ll get outside and see what (if any) difference it makes on the ground (the only place it matters). Big thanks to James Andrews for feedback on this and all other posts in this inquiry. Thanks also to those of you starting to comment – it is fantastic to get your thoughts during the inquiry so they can inform and influence what happens next. regardless of whether or not there is a feedback loop during implementation. I was certainly taught design by fabrication on my PDC. As you have shown it has become an ingrained and almost expected approach to permaculture design. What I read here resonates with how I have come to approach designs i.e by generating, by differentiation. To me design by generation is the ‘natural’ approach. Logical even. Practical certainly. Each decision once implemented changes the ‘whole’ and almost always forces one to look again at that whole and differentiate the new whole. Design -> Implement -> Evaluate -> around it goes for each element/decision. Your graphic of the Permaculture Design Process illustrates this. Thanks Nick and that’s all great to hear/know especially that it rings true both with what you were taught and what resonates better with what you’ve come to. The next post will drop tomorrow – happy reading and do comment again! I have found playing with bamboo onsite to be extremely productive. It is only possible on a fairly clear site. It works really well as a collaborative process with others (and for reality checking my own ideas). It allows quick mark outs of beds, trees (to exact height if you have long bamboo) and the corners of structure for example (string can be added to ‘solidify’ lines. We then walk around and feel out what it is like, adjustments can be quickly made. In some cases that is all that is needed, stakes are left in place, or sketches made allowing written detail to be attached. It is a kind of drawing on the land, a step closer to doing than drawing on paper. Having said that I do love drawing, and find that beneficial patterns emerge in the more abstract drawing process, patterns difficult to recognise on the ground. Drawing engages the eye, body, memory of the place and if spontaneous stimulates connecting ideas. Dan, thanks for working through this so thoroughly! I feel like a child opening the next door in an advent calendar when there is a new post here (how much longer to Christmas?). Ever since I took my PDC and one of the teachers said she’d rather teach people permaculture than design there properties, I have felt like permaculture can do better than fly-in fly-out designers worshiped as rock stars. The way I feel designing works best for me is by being a gardener rather than a designer. The drawing and plant research happens between my fortnightly visits and the design unfolds while pulling weeds and mowing lawns. Good one Alexander and though I’m not ready to fix a date for christmas I do hope you’re going to like your present ;-). I like the way you describe your approach. Thanks Dan. Looking forward to seeing some examples of how this would look comparing a traditional fabricated design to a generated design and how to get a client on board with not getting big picture master plan as they so often want. Me too Bret ;-). Not too long to wait now, I promise. Besides if I build any more suspense it’ll probably be a let down ;-). Fantastic work Dan, your visual diagrams capture the multiple layers of thinking that are closer to life than text description can. I have found your ‘the permaculture tree (take three)’ to be very useful in this way also. I am keen to jump in to the conversation here, I have some catching up to do! I am not a big reader but am actively involved in design facilitation professionally in Dunedin. For me I think we place a lot of emphasis on the drawn image, as James Andrews says, they are seducing, and power given to them with labels such as “Project Masterplan”. When in reality a plan is a fraction of the relationship and hopefully learning journey between client and ‘designer’. There is also conversation, time spent on the land together, shared resources, shared examples and inspiration, project descriptions in writing, management plans etc. If I have time I would share a project process with you by putting your fabricating diagram on top of the generating diagram as that is how I see that this particular project played out. To be clear, I offer this as an example, without attachment, I’d love to hear what you think. I meet with clients for a couple of hours to 1: listen, to their dreams, ideas, wishes and their observations of the site. 2: carry out my own site assessment. 3: Provide as many resources to them for their benefit. 4. to offer my services (they chose a “concept plan”. I usually jam out initial ideas as soon as I get home. Then Draw up a detailed base plan. Then spend a week playing with layouts on paper using as many design methods as I can. I return to the property and test the layouts on the ground with bamboo stakes. Walking through, testing heights, the feel etc. Re sketch and then meet with the clients again to walk around and talk through my ideas so far and hear their thoughts in the mean time. This can happen a few times if there is much to resolve. They liked it and asked for an estimate to build. This required me to sketch details for costing, some, such as the pergola design, I ran by them. We negotiated, removed some details and booked in the excavator. This perhaps brings us to the large spade at the bottom of the fabricating diagram? Excavation finds shallow rock!, therefore concept Macro retaining is not possible, but we have lots of rock! Overnight I sketch an image of what a stone wall would look like instead. The clients like it, and we replace one stair with a seat in the wall instead. Many more such discussions along the way… paths become curved instead of square along the way, the rear lawn becomes round and after grass is installed there they use it and request paver stepping stones within it, so we install those. 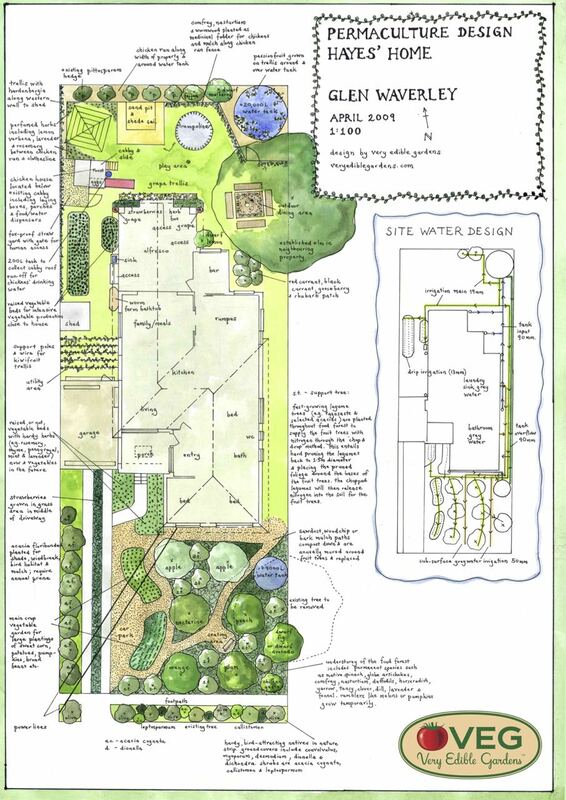 Importantly I think, the planting plan is never fully drawn, just sketched to enough detail and approved AFTER hard landscape is complete, in order to buy plants. Final layout is on the ground on the planting day. Plants are my favourite part, why I do this, and I find that layout with them in hand is much, much better than on paper! Conclusion: This was a very nice project to work on, where there was enough trust and good communication that it could evolve as construction was done. A ‘concept plan’ was completed, this gave enough detail and ‘feeling’ to allow pricing and confidence for the client to go ahead. The Making Permaculture Stronger conversation is giving me give descriptive language for and perception of the times when I feel that working on a project goes well. This will be of benefit for future projects in describing how a project may unfold to a client and letting go of the sometimes taxing pressure on myself to come up with Detailed Design when the time isnt right. Where does fabricating and generating sit in this example do you think? Hey Jason and thanks for sharing and I’m excited to be entering the territory of others sharing real-life design process examples – obviously enormously helpful in seeing how the ideas we’re discussing do or don’t apply. Makes me wonder about a better format for facilitating such sharing. Anyone got any ideas? Your mention of putting the fabricating diagram on top of the generating diagram is most interesting given it’s part of the territory I’ll explore in the upcoming post! I think your example is of this nature. You did a bit of tentative fabrication then the site was most helpful when the submerged rock said “Hey buddy and guess what – it’s generation time.” It reminds me of the very similar example David Holmgren gave when I first discussed the fabricating (imposition) vs generating (unfolding) process distinction with him. He designed his house (off site, sitting in his Melbourne share house) in a lot of detail, including the detail of where it would site on the site. Then site prep started and a rock reef said “uh ah bulldozer – this is as far as you go.” And so the house moved a few metres to accommodate the reality of what was going on. Then he gave the contrasting example of the barn, which was highly generated. To cut a long story short they noticed they were stockpiling materials at a certain spot and so they built a roof over that spot. I’m also delighted if these discussions help relieve the pressure that you or I or anyone else can sometimes feel when clients expect you to pull a detailed design out of thin air (when as you imply in reality if you explain the folly in this, the fact that you’ll often times being doing them a disservice in opening the door to a bunch of premature and arbitrary decisions, they are fine to wait!). Finally that’s great to be reminded how you use bamboo stakes to mark out as part of your design process. This was a very nice project to work on, where there was enough trust and good communication that it could evolve as construction was done. From my experience with software design, this is one of the key elements (maybe the key element) that makes iterative/generative/CDDAYG design work. Communication and trust. Without communication, the outcomes can vary so much from the expectations that the client can get quite disappointed. Without trust, it’s hard to pitch the idea of incremental design with room for changes in direction (the client thinks you must be incompetent because you can’t come up with a set-in-stone plan).